Ever seen a librarian pop a wheelie? 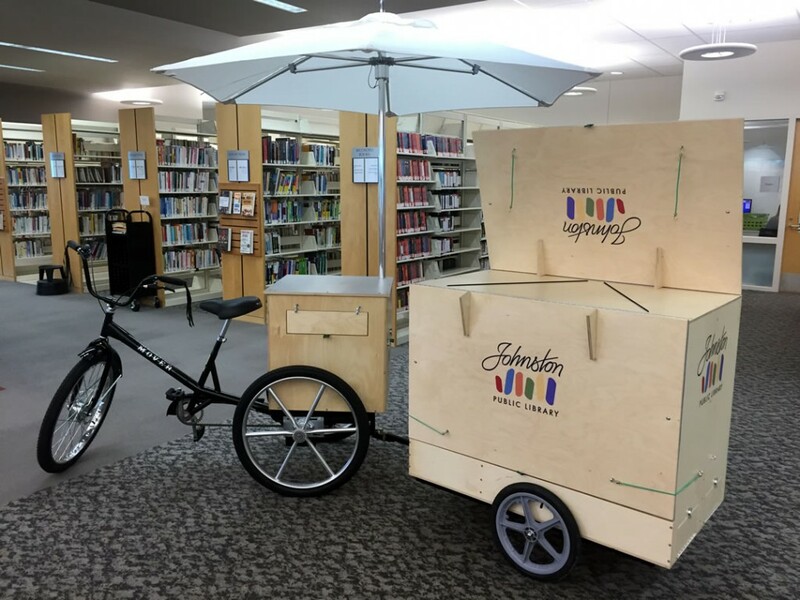 Get ready to—the Book Bike is here! in locations all around Johnston. There are a couple bike book mobiles in other states, but to our knowledge, this is the first library bike book mobile in Iowa! Interested in hosting a JPL Book Bike stop? The JPL Book Bike is a Workman Cycles “Mover” industrial trike and the box and trailer were custom-built by local craftsman Mike Gustafson, owner of Nestcraft Studio in Des Moines. The bike has been outfitted with an electric mid-drive motor custom built by Michael Backus, owner of Lightning Rods.